The hard thing about trying to write a summary after a big playoff game like Sunday night’s Game 4 between Houston and Portland is that almost everyone saw it, so what else can I say about this one that you didn’t already see? It was an incredible 89-88 win that puts the Rockets on the verge of ending a first round playoff drought that’s lasted almost 12 years. Yao throws one down on Travis Outlaw in a bounce-back game for Yao where he scored 21 points on 7-of-14 shots, grabbed 12 boards, had 2 assists, and 1 block. Click here for more photos from the game. There were so many facets of this game too numerous to recap at this late hour, and it would probably be redundant because you know what happened – the Rockets overcame a 6-point deficit in the 4th quarter when they were hanging on a thread, and bucked a dismal 5-20 record they’ve had this season when entering the 4th quarter trailing. –	Chuck Hayes, who only played 4 minutes in the game, drawing a charge on Brandon Roy with just 10.7 seconds remaining that gave Houston the ball back. –	Yao hitting some big shots in the lane to prove my prediction correct that he would have a 20+ game in this series after only scoring 7 points in Game 3. He finished with 21 points on 7-of-14 shooting in a game-high 44 minutes of action. –	Kyle Lowry and Carl Landry skying for big offensive boards late in the game to keep offensive possessions alive. As thrilling of a victory it was for the Rockets, let’s keep things in perspective that before anyone thinks they have won this series, the bounce of the ball the wrong way or one shot made here or there by the Blazers over the last 2 games could have given Portland a 3-1 series lead, not Houston. The main thought I have in my head as I look across the boxscore where 5 Rockets scored in double-figures is the same thing I wrote after Game 3: the Rockets no longer need to rely on a “Big 3” strategy to win a series. They are balanced across the roster to do it by committee such that even the national media (like TNT analysts Doug Collins and Kenny Smith) are starting to pick up on how balanced they are. I remember saying several months ago even before McGrady went out that this was the strategy the Rockets should pursue: cultivate the talent they have on the roster to get them comfortable making big shots and big plays, rather than stand around waiting for a “go-to” guy to save them. I’ve always hated that approach because it’s relatively easy to shut down most “go-to” guys (especially McGrady who is overrated because he isn’t really that clutch in the 4th quarter anyway), it doesn’t diversify your offensive attack, and it doesn’t build for the future. In a game where your starting backcourt is 6-for-25 (Ron Artest 5-for-20; Aaron Brooks 1-for-5), your point guards are 2-for-11 (Lowry 1-for-6), the team shoots only 40%, and it misses 8 free throws and your opponent misses none, you’d expect a nice fat loss. But throw in those big shots and rebounds, including 10 offensive boards in the 4th quarter that led to 13 second chance points (out of 28 for the game), and you’ve got an astounding victory that shows the Rockets are gaining confidence, and they have the heart to pull games out they had a hard time doing before. Although Artest shot only 25% from the field, it could have been worse, but he passed up several wild shots and got the ball to his teammates, including Yao, for a team-high 9 assists. And the power forwards of Luis Scola (17 points on 8-of-18 shots) and Landry (4 points on 2-or-4 shots) has been one of the main missing factors over the past few years in the playoffs for Houston. I remember that Dallas series a few years ago that the Rockets lost in 7 games. The main thing they were missing in that series was Juwan Howard, out with a heart condition, and not having a power forward who could drain a jumper from 15 feet while Yao was commanding attention from double teams in the paint. Now a few years later we’re seeing just how valuable a power forward who can hit a jumper can mean to this team. With all the Rockets who are getting great valuable playoff experience and delivering with big shots, you’ve got to feel really good that this experience is going to pay off big-time for future playoff runs. They may not go very far in this year’s playoffs, but if they are able to win this series against Portland and most likely face the Lakers in the next round, the Rockets will have a lot of people around the country rooting for them since everyone loves an underdog, especially against the heavily favored Lakers. The Rockets need to capitalize on this golden opportunity to move past Portland so they can gain even more fans around the country when more people will start watching the games when there are only 4 teams playing in each conference. All I know, though, is that Game 5 is obviously not going to be easy for the Rockets to pull off. They will have to play out of their mind to overcome a cornered Blazer team in Portland. Because of the late ending of Game 4, I’ve got to shut this puppy down, but I plan to watch Game 4 again on my DVR Monday night so I can find other nuggets of information that might not have been picked up by the sports writers or TV analysts who have also commented about this game you most likely saw. This entry was posted on Monday, April 27th, 2009 at 2:47 am	and is filed under 2009 NBA playoffs, vs. Portland. You can follow any responses to this entry through the RSS 2.0 feed. Props to you for the late game report as always. Like everyone else, the addrenaline from the win probably kept you going even after the game. Oh how sweet it is. 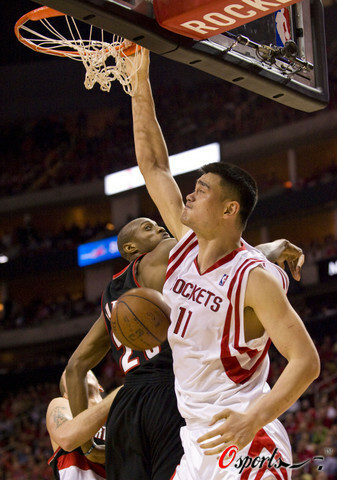 The Yao Ming led Rockets will finally win a playoff series. Oops I spoke too soon. But I really feel confident that we will not lose 3 straight games dammit!. We are just not the same old Rockets anymore. John I definately saw a difference in Yao's game yesterday. He followed what Adleman suggested, which was not to waste so much energy fighting for post up position and just wait to let the game come to him. Last night I saw Yao being more patient waiting for the ball. He just stood his ground and just got into position when the chance came. And I loved how he skys for the rebounds now. His presence is definately showing now. A game high 44 minutes for a big man, that's just incredible. What can I say about Lowry and Landry. They are just clutch role players. Battier has been tremendous. Running around to stick Roy AND he nails daggers. Just a couple of things worry me, and that is Artest and Brooks. Artest is still tossing up contested shots late in the game clock and I feel that is bogging down the offense a little bit, and Brooks is missing too many late game free throws which I felt wouldve iced the game earlier. But regardless I am proud to say that we are finally turning the corner and are learning from our mistakes that have haunted us all season. The Rockets are just ONE game away from ending that playoffs jinx that was bugging them all these years. And Luis Scola is also just ONE game away from winning his first playoff series. Simply unbelieveble!!!! I feel all this is down to the Rockets team harmony and cohesiveness which they've shown since Tracy McGrady was out injured. They prove that this team is more than just a franchise player. You gotta give them credit for that. But whether or not are they good enough to post some tough challenge against the Lakers is another matter. But I kind of feel they do what it takes to pull a surprise or two. We'll just have to wait and see. Please check out my game re-cap from my own perspective. I would appreciate to hear from your views about where does this series goes. My pick, Rockets in Game 6. If Artest wants to score, he should attack the rim. He should refrain from putting up jumpers. Jumpers need feeling which is not with Artest at the moment. Right now, his jumpers are equivalent to turn-overs. If the Rockets lost Game 4, his jumpers would be accountable for that. He is playing pretty good, like every other guys in the team. But he would have been even better without the jumpers. He behaved very well in Game 3. But all of a sudden, he forgot what he should not do. There is nothing wrong with the loss of the shooting feeling for a while. But there are other ways to compensate for it. Ron, do not get me wrong. You are playing pretty good. You have made the difference for the Rockets this season. The best luck for Game 5. I would agree with all your statements there!